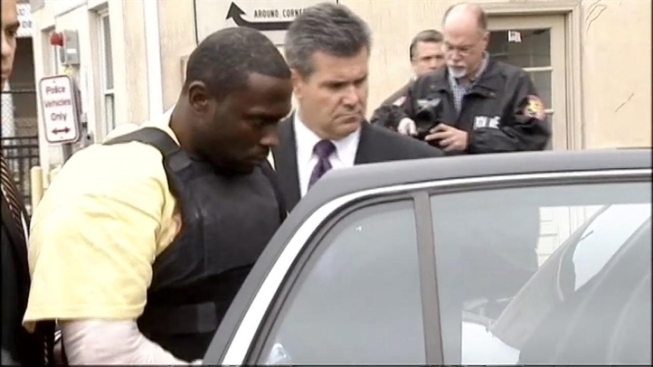 An ex-convict suspected of gunning down a Long Island police officer in Queens and then fatally shooting a carjacking victim was arraigned on two counts of first-degree murder and remanded without bail Thursday. Dozens of police officers filled the hallways of Nassau County's First District Court while Darrell Fuller was arraigned. A legal aide attorney representing Fuller pleaded not guilty on his behalf. Wearing the dead officer's handcuffs and what appeared to be a yellow hospital gown, Fuller said nothing during the arraignment. Fuller was transferred from a hospital to police headquarters on Wednesday. He had been hospitalized Tuesday after authorities said he reached out to associates and "engineered a situation that ended with him being wounded." Prosecutor Mitch Benson said Fuller was trying to play the victim. Police say he was arrested hours after he fatally shot Nassau County Officer Arthur Lopez, who suspected he had been involved in a hit-and-run car accident. An ex-convict suspected of gunning down a Long Island police officer in Queens and then fatally shooting a carjacking victim was set to appear before a judge Thursday. Darrell Fuller was walked before reporters on his way to the courthouse. The 33-year-old Queens man is suspected of fleeing that shooting and then killing a man while carjacking his vehicle. Another individual, Gerald Williams, was arrested in Queens for allegedly helping Fuller, Nassau County District Attorney Kathleen Rice said Thursday. The 27-year-old Williams was found with the weapon used to kill Lopez. The gun was illegal, Rice said. Williams was charged with criminal possession of a weapon. Officers in Nassau County who had just buried a fallen colleague last week now have to brace for the funeral of another officer killed on the job. Greg Cergol has more. Fuller served four years in prison after pleading guilty to attempted murder in 2005, authorities said. He was jailed again in 2010 after violating his parole on a drug arrest but was released in May 2011 because there was insufficient evidence to support a stiffer sentence, the Nassau district attorney said Wednesday. Lopez died Tuesday after getting shot in what had started out as a traffic stop near Belmont Park. A funeral for Lopez is planned for Saturday on Long Island. In Bellmore officers are mourning and trying to re-group after losing one of their own, Arthur Lopez. 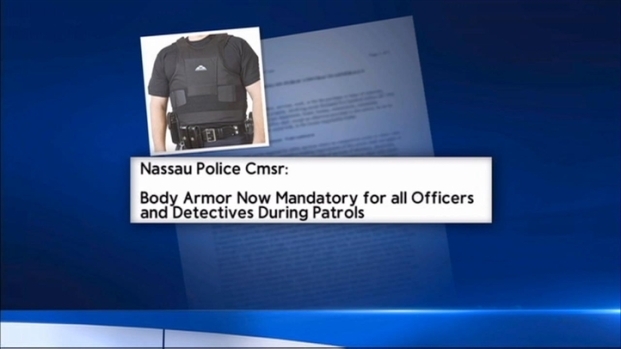 They also face a new departmental policy in the wake of Lopez's shooting death. Gus Rosendale reports.